Harties Boat Company would like to welcome you aboard Danny Buoy to experience Hartbeespoort Dam from the water on one of our Daily Lunch or Sunset cruises. Our route takes us from Kommandonek, passed Caribbean estate and Sandy lane golf course to the Kosmos foreshore and the quaint Kosmos Village to the dam wall. Passing the Zoo and snake Park as well as the Transvaal Yacht Club. We then hit open waters and cruise across to Eagle Waters and Pecanwood estate and golf Course, taking a look at some of these fantastic waterfront homes. We then head passed The Islands and back to the harbour. All of this while sipping on bubbly, enjoying a buffet of gourmet finger and fork snacks and good conversation. 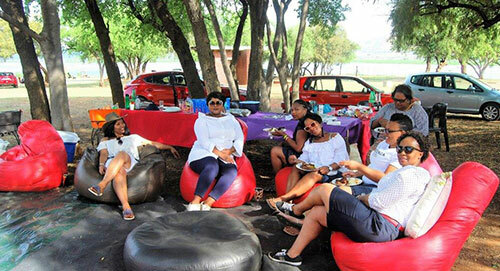 We depart daily for a guided tour of Hartbeespoortdam taking in all the history, fauna and flora of the dam and the area whilst snacking to a scrumptious selection of traditional South African hot and cold finger and fork gourmet snacks. We board Danny Buoy with a glass of champers in hand and enjoy a 2 hour cruise around the dam, taking in all the sights and sounds of Harties up-close. Canapés are served as well as a selection of hot and cold cocktail snacks on this cruise of celebration. There is just something magical about seeing the sunset over Harties. What a great way to celebrate that special day with family & friends, book a table and we will decorate it with table confetti, balloons and give you a complimentary cake for groups or 5 adults or more. View our snack platter menu. View our breakfast cruise menu. If that is not enough then why not book one of the following combos that we have put together especially for you. A daily cruise and a game drive with Shingalani Safaris who will pick you up at the Boat and take you into the Game reserve to view the animals at close quarters. 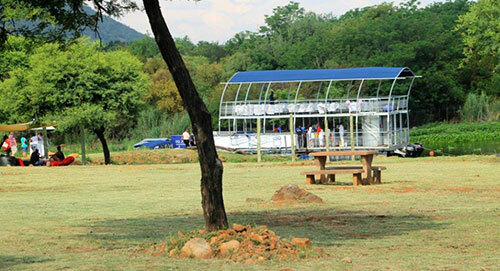 Enjoy the ultimate Harties Experience and book a cruise and the Harties Aerial Cableway combo.